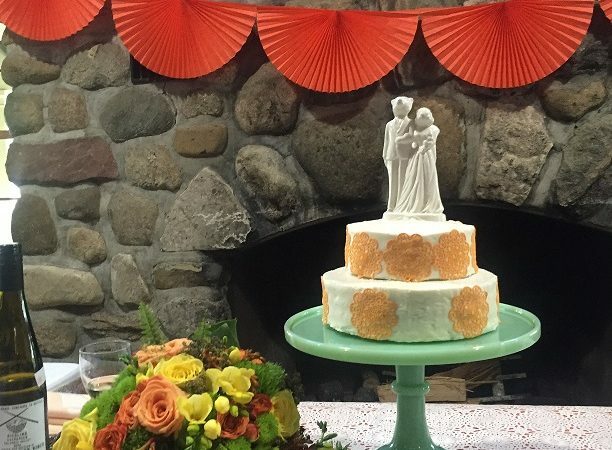 WEDDING Food and Drink and more Decor! And now for wedding food and drink and a bit more decor! We wanted to have high quality delicious nourishments for friends and family. We like good food, local food, and handcrafted food. So, in honor of falling in love over tacos we had Donkey Taqueria here in Grand Rapids bring in the good stuff! It’s a favorite place of ours, if you haven’t been there you should go! We had 2 types of tacos, the potato for our veggie friends and pork carnitas for the carnivores, plus salad, rice, vegan beans, and let’s not forget the chips and guacamole for cocktail hour. SO good! The great thing about all this deliciousness is that you could make them up just the way you wanted so it really catered to all the friends and family, from vegan to vegetarian, to gluten free, everyone was super happy and thrilled when they discovered the menu. We’re talking seconds and people admitting to going up for thirds, ha. Thank goodness Cat took a pic of her food plate, doesn’t this look SO good! Yummmm!!! 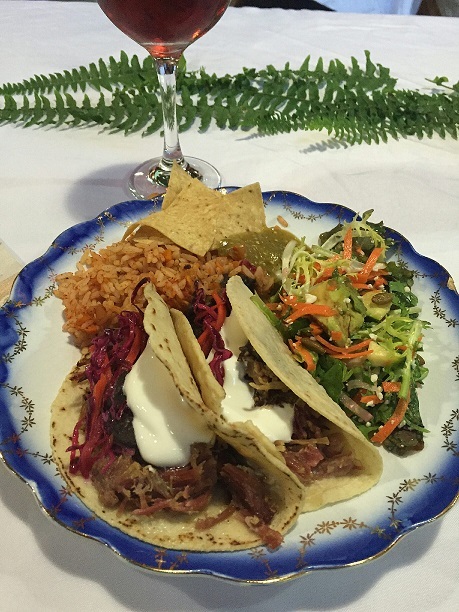 All served on vintage dishes! Oh my gosh, I LOVED how these all looked together. Here’s a close up of a couple more neutral vintage plates, vintage silverware, glasses, and my giant collection of vintage napkins sure came in handy! Here’s a look at one of our settings. 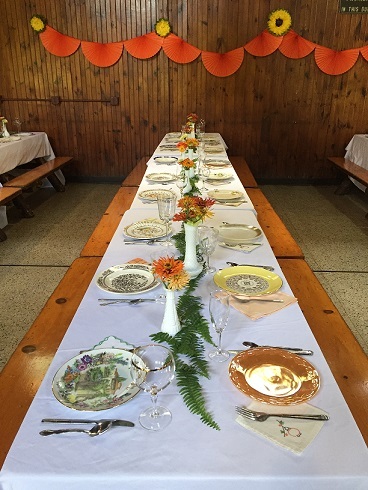 We moved the picnic tables provided by the venue into several neat rows, styling them with vintage dishes, my milk glass vases down the middle with our home grown zinnias, and fern leaves as the table runner. 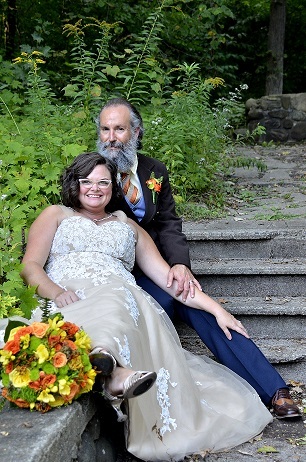 It was the perfect blend of color, vintage, and woodsy warmth for our fall wedding. As I mentioned before, dishes, and all sorts of vintage props can be rented from Deanna at Gypsy Soul Antiques! We sure had fun picking out all these gorgeous pieces!!!! You’ll love working with her! And for drink we had a couple of amazing beers from Greyline Brewery. One of the smallest yet really the best brewery in all of Grand Rapids, or Michigan for that matter. It’s run by our talented friends, there’s no one that knows beer better, a la Nate Walser, supreme beer master. If you know anything about beer you just had an exclamation point go off inside your head. Go visit Greyline and you’ll find a cool old mid century style building on the NW side with sophisticated chill decor, great food, and lots of brew to choose from! And needless to say, our beer loving friends were QUITE pleased with the drink option. We also had some wine at the wedding, and coffee served up in my grandma’s 40 cup percolator and in vintage cups and saucers. I had a pic of the little kegs inside of the vintage laundry tubs but I can’t find it! They fit quite nicely and right into our decor! 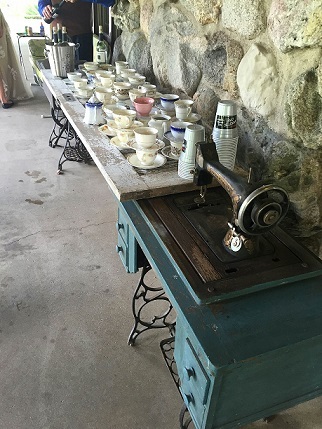 Here’s a shot of the sewing machine bar that held coffee, wine, cups, and cups for beer. Deanna and Doug created this piece just for me with vintage sewing machine tables on each end and an old door in the middle. How fitting, wouldn’t ya say! A little cake close up, loving the doilies, and there’s a peek at the pies. I used some vintage yardage I had a bolt of for the table to add a little color and vintage style. I see the table is ready to intercept the taco goods here too 🙂 Oh and how cute is the cake on the large jadeite stand! Now, let’s talk cake! Our talented friend Genevieve made a darling little carrot cake for us, yummy! 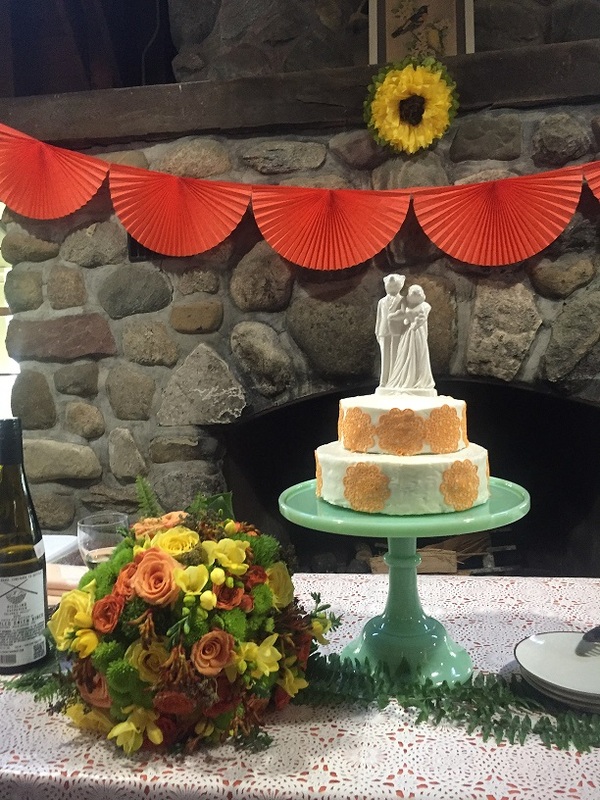 I purchased some orange doilies made of sugar for some simple decor on the outside and used a little handmade ceramic cake topper I purchased years and years ago in the early Etsy days from a store called Melabo. Simple and sweet! 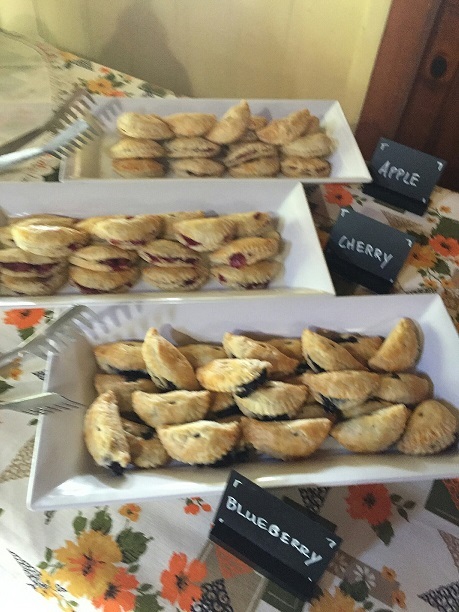 In addition, Genevieve made some hand pies, oh my, SO good! They flew off the table as I knew they would! I loved having little pies at the wedding. As you may know I find pie quite sentimental, as I’ve posted before, I used to make pies with my grandma growing up and her rolling pin and pastry cutter are among my prize possessions. We also had more of those delicious apple fritter holes we had at the brunch, heaven. You should also take this opportunity to check out Genevieve’s CSA here in GR, Save the Season. AND she’s the chef at Life Fuel, a healthy meal service here. She’s one smart talented lady! So pretty! 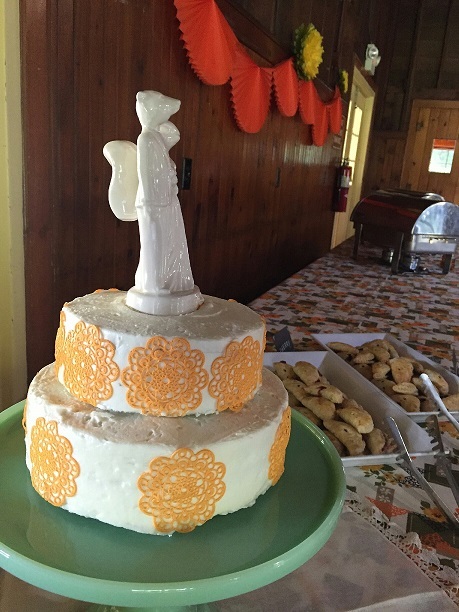 The jadeite stand from Deanna at Gypsy Soul is the perfect piece to display the cake! It’s SO appropriate that the pic of these hand pies is a little blurry. They went FAST! Apple, cherry, and blueberry, that’s what my grandma used to make for us three kids. I love it so much! Now here’s a little takeaway we made. 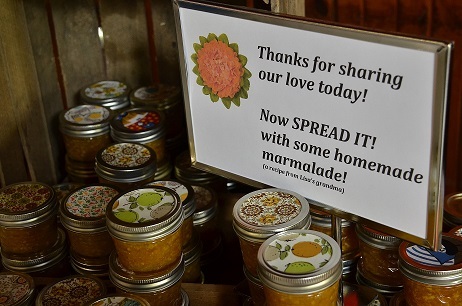 My mom and I and then my mom and dad canned delicious little jars of homemade marmalade using my grandma’s recipe. Another little way to bring her into my day. I then cut little pieces of vintage fabric for inside the lids. And here’s a shot of our head table. I wanted something different and a little special of course. We were seated in front of the gorgeous stone fire place, bunting and a paper flower accented it while a sweet framed vintage print of 2 orioles sat on the fireplace. I styled 2 vintage fiberglass Herman Miller chairs from home into the mix, just the right color! 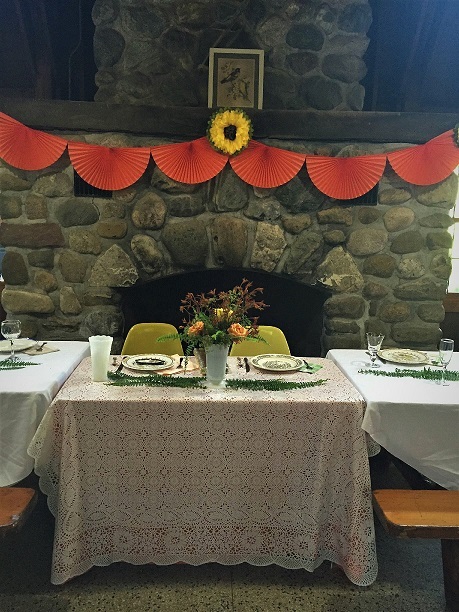 We had a small table we could easily get in and out of, a feature floral arrangement, and a thrifted orange sheet worked perfectly under the vintage doily plastic lace tablecloth we got together at an estate sale. Lovely delicate features setting our table off from the rest. 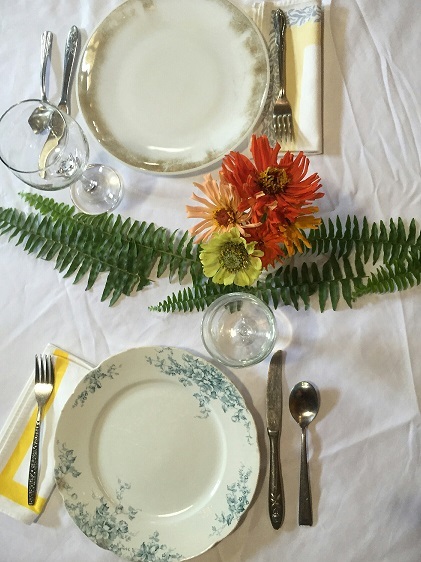 I also styled a small table for family with a vintage tablecloth and special floral arrangements. Here’s a fave pic of us. All in all it was the most beautiful relaxed day filled with great food, drink, dear friends, and family, and most of all love. 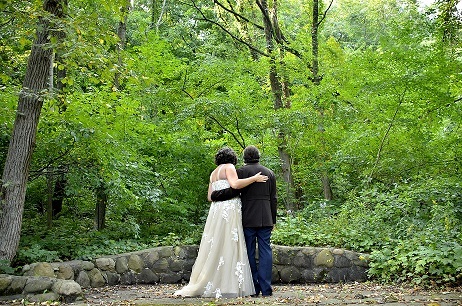 I adore this pic, surrounded by the beauty of nature in a quiet spot away from it all. We look forward to the future together. Growing like these beautiful trees in the ever changing landscape of life.